Pictured is Jack Byard, 21, of Argyll Road, Ripley, who was given a 34 week custodial sentence for two counts of assault and three counts of damage. A thug has been jailed after he subjected a motorcyclist to an unprovoked and prolonged attack in the street. Chesterfield magistrates’ court heard on Monday, March 14, how Jack Byard, 21, was with Connor Hosie, 19, both of Ripley, when Byard assaulted the motorcyclist and damaged his bike after he had stopped at a junction. The motorcyclist refused, according to Mrs Allsop, and a second male got on the back of the bike before one of them got off and the motorcyclist was struck in the face and suffered further punches to the head. Mrs Allsop added that the complainant shouted for a friend who lived at a property nearby but when there was no response he was subjected to further punches and kicks to his leg and pieces of concrete were thrown at him. The court heard how the partner of the complainant’s friend opened the property door for the motorcyclist to take refuge and a rock struck the door. Mrs Allsop added that the two males were seen jumping up and down on the complainant’s bike and the motorcyclist was subjected to a further attack with punches and kicks before going back to his friend’s address. Following Byard’s arrest, police confirmed he had been put in the back of a police vehicle and he kicked a rear window and the broken glass showered and cut an officer. Byard, who committed the offences on March 12 during a suspended sentence for possessing a blade in public, pleaded guilty to assault, damaging a motorcycle, damaging a door and another vehicle and assaulting a police constable. Defence solicitor Peter Jones said: “Mr Byard has no recollection of the incident due to intoxication. Magistrates sentenced Byard, of Argyll Road, Ripley, to 34 weeks of custody. He was also ordered to pay £500 compensation. Hosie, of Woodside Avenue, Ripley, admitted damaging the door and the motorcycle but he has denied assaulting the motorcyclist. 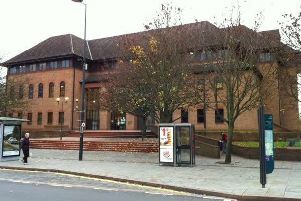 His case was adjourned for a summary trial at Chesterfield magistrates’ court on April 26. Hosie was released on conditional bail with a curfew on the grounds he does not contact Byard or the complainant.